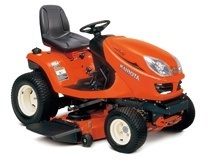 Mow your lawn and mow it well with Kubota's revolutionary Glide Steer technology. Glide Steer enables the perfectionist in you to make sharp turns while cutting down on potential turf damage. The result is a flawlessly cut lawn time and again. Plus, you'll get the job done quickly with outstanding All Wheel Drive traction and a 48 inch cutting width.